Often, discussions of resistance against the Nazi Regime and its many atrocities focus on men and the role they played. During the years of the Third Reich, men were thought to be able to be more involved in resistance due to physical attributes; however, often overlooked is the role women played in defying the ideology of the Nazi Regime. Women’s forms of resistance were as varied as the women themselves. 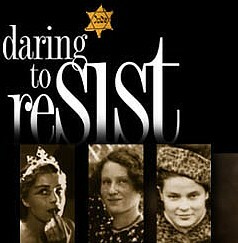 Female resistors ranged from the wife of an SS officer to a young thirteen year old Jewish girl. Their defiance of the Third Reich is an example of the courage of many who consciously decided that some, if not all, aspects of Nazi Germany needed to be destabilized. The most apparent form of resistance was from the citizens of Germany as they had the most freedom to act within wartime society. Nicole Bronstein will focus on women resistors within Germany and how their actions helped to fight against Nazi oppression. A second from of resistance came from women within concentration camps. Although the possibility of survival was bleak, as Rosie Smith explores, these women still fought against their oppressors. Another less obvious form of resistance, as explained by Amber McDonald, came from the gender roles that women were expected to adhere to in the Third Reich and its influenced territories. In using the traditional expectations of women they were able to use sexist stereotypes to disguise their actions in combating an unsuspecting enemy. Aubrac, Lucie. Outwitting the Gestapo. Lincoln: University of Nebraska Press, 1993. Baumel, Judith Tydor. Double Jeopardy: Gender and the Holocaust. London: Vallentine Mitchell, 1998. Eman, Diet. Things We Couldn’t Say. Grand Rapid, Michigan: Wm. B. Eerdmans Publishing Co., 1994. Gurewitsch, Brana. Mothers, Sisters, Resisters: Oral Histories of Women who Survived the Holocaust. Tuscaloosa: University of Alabama Press, 1998. Harvey, Elizabeth. Women and the Nazi East: Agents and Witnesses of Germanization. New Haven: Yale University Press, 2003. Ofer, Dalia and Lenore J. Weitzman. Women in the Holocaust. New Haven: Yale University Press, 1998. Owings, Alison. Frauen: German Women Recall the Third Reich. New Jersey: Rutgers University Press, 1993. Stibbe, Matthew. Women in the Third Reich. New York: Oxford University Press, 2003.